glowing easter egg hunt – ActiveDark.com – Glowing Ideas! Previously, we have discussed putting mini glow sticks into plastic easter eggs to make them glow! 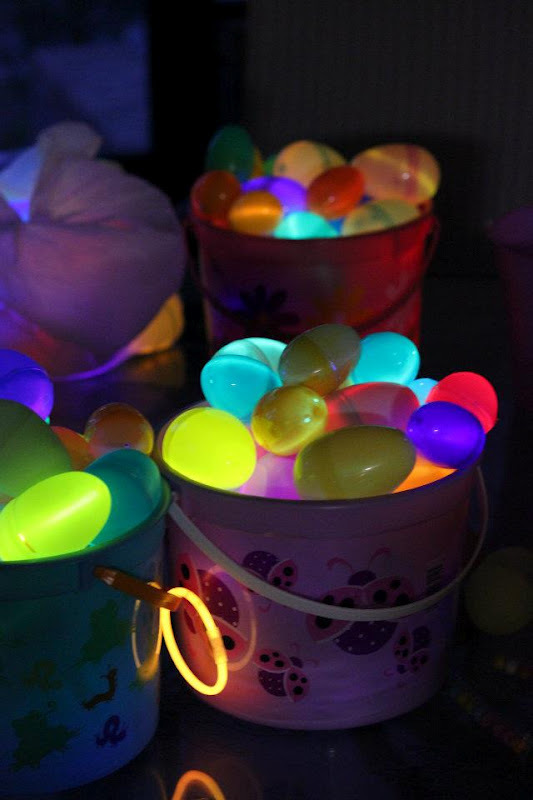 In this article we look at a couple other bright ideas for your next big glowing Easter egg hunt! Let’s start with brightening up the hunting fields a little by spattering the grounds with some fun glowing decorations! One easy do-it-yourself glow craft idea that works great for Easter egg hunts is a bunch of Glowing Toadstools! Simply wrap some mid-sized glow sticks with paper and tissue and shape the top part into simple mushroom shapes. These wonderful little glowing toadstools will create a fun glowing effect throughout your entire Easter egg search area! Another fun way to brighten up the hunting fields is to add some fun glowing flower and butterfly decorations throughout the area. Use your imagination and create your own glow creations as well! Circular glow connectors and glow bracelets will allow you to create these fun and unique glowing decorations. The center of the glow stick circular connector also has a small hole so you can use a small tack, nail or even string to attach your decorations to nearby trees, fence posts or hang them around. Now that we have a beautiful glowing easter egg hunting ground, everybody will have a bright time hunting for those glowing Easter eggs among a field of glowing mushrooms and flowers! As we’ve mentioned before, Miniature Glow Sticks work perfectly for placing inside of standard plastic Easter eggs. For a slightly brighter glow (and a little bit more work) you can also use Glow Bracelets and some string or an elastic band to ‘clump’ the glow bracelet in a folded manner and place that within the plastic Easter eggs. This may work better for larger style plastic eggs. Also be sure to decorate your hunters (and their baskets) with a variety of Glow Bracelets, Glowing Glasses and Glowing Bunny Ears! This Glow Craft and Glow Party Pack comes with a fun variety of glow accessories perfect for highlighting your Easter Egg hunting party!